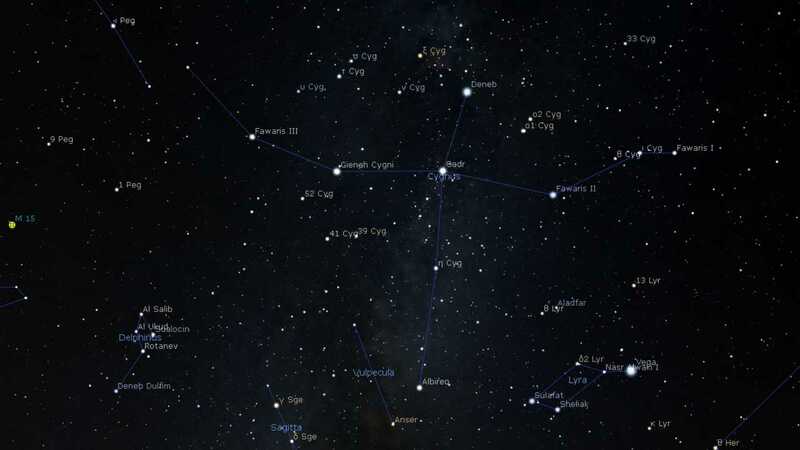 Cygnus is usually associated with the Summer and one of its stars, Deneb (α Cyg), is one of the three members of the Summer Triangle asterism. 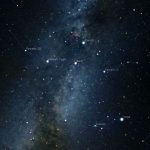 However as Christmas approaches, rather than being lost in the multitude of stars overhead, it can be found bolt upright in the West at sunset offering the view of a cross in the heaven; hence the asterism name the Northern Cross. For those more familiar with the shape of the Swan, it is nose diving into the western horizon. 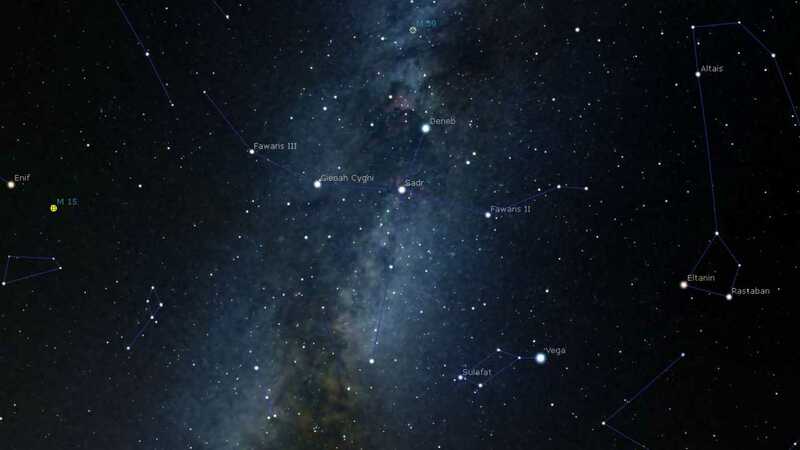 The constellation spans the depth of the Milky Way and so is star studded if viewed in binoculars or telescopes. This view across/through the local spiral arm of the Galaxy means that a number of objects can be seen with the aide of telescopes. 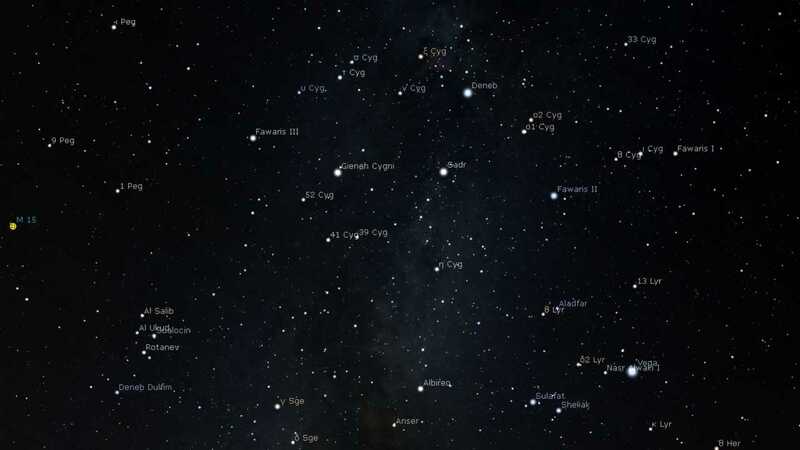 M29 and M39 are Open clusters established in Messier’s list, however, arguably the finer objects were just beyond the capabilities of their telescopes then and so are open to us with a medium aperture scope. Albireo (β Cyg) is famous within the astronomical community for the beauty of the double stars it can be resolved as through binocular or telescope. Although designated β it is not the second brightest in the constellation; it is only 5th at magnitude 3.2. Of the two components, one is sapphire blue and the other brilliant gold. This brightness is from the gold giant star A which is 70 wider than the Sun. This gold component is a binary system. Attempts to characterise its binary partner spectroscopically have produced differing results and so it may have more than 1 partner. The hot blue star B companion is magnitude 5. 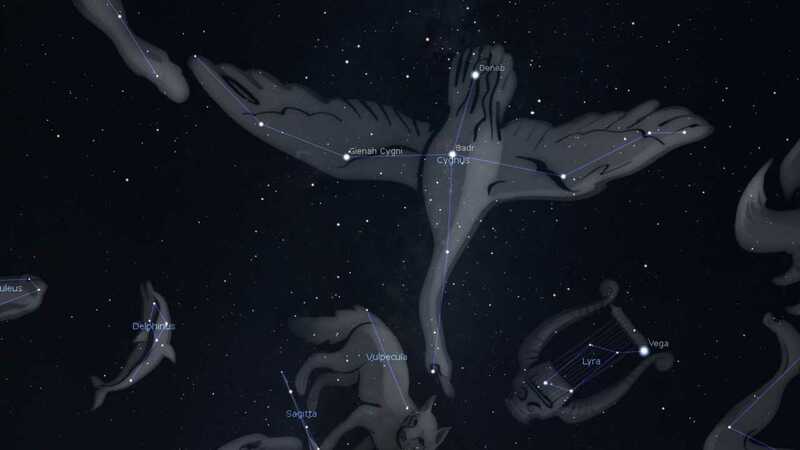 Cygnus should be on the list of constellations that most people know. 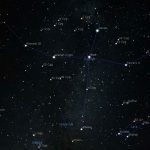 It is reasonably easy to find and although not circumpolar, its main star Deneb (α Cyg) is at UK latitudes so observable the year round. 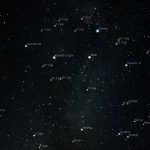 One way to find it is to go from the bottom right of the Plough (Merak), through the bottom of Ursa Minor and continue on the line for twice this distance. 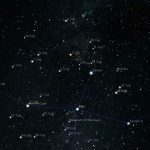 This should line you up with Sadr (&gamma; Cyg), the centre of the cross of Cygnus. 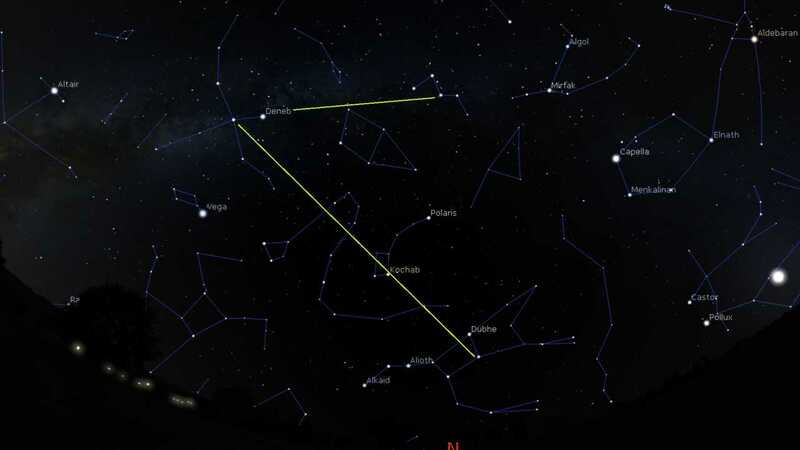 Alternatively find Cassiopeia and from Ruchbah through Navi, follow the line to Deneb. One common explanation for the Swan is in Greek mythology. Zeus transformed himself into a swan to have his wicked way with Spartan Queen Leda and avoid the immediate wrath of her mortal husband, King Tyndareus. She gave birth to two sets of twins, the immortal Pollux and Helen and mortal Castor and Clytemnestra. 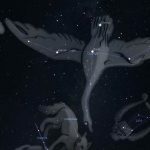 An alternative explanation is that the Greek tragic hero Orpheus, who was murdered by the Thracian Maenads for not honouring Dionysus, was transformed into a swan upon his death and was placed next to his lyre in the sky. 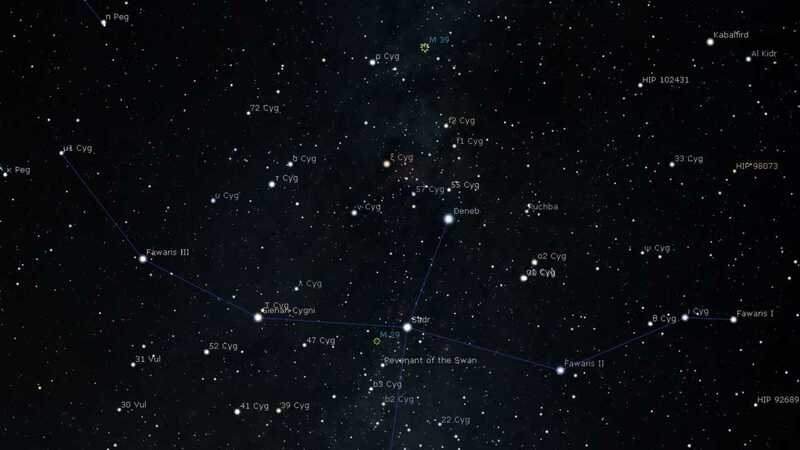 M29 and M39 are open clusters within the constellation of Cygnus. Given a little more aperture and better optics, many more delightful objects listed in the New General Catalogue pop out including the Fireworks Galaxy (NGC 6946), the Pelican Nebula (IC 5070), the North America Nebula (NGC 7000), the Crescent Nebula (NGC 6888), and the Veil Nebula (NGC 6960, 6962, 6979, 6992, and 6995). NGC6826 is an interesting beast as the central star is visible looking directly at it through the eyepiece but without anything else. Avert you vision to one side of the centre and bang (silently) a halo of planetary nebula pops into view. Allow your eye back to the centre and again it is gone, Poofff. So was discovery the Blinking Planetary. 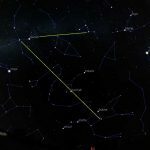 Cygnus is associated with two regular meteor showers each year: october cygnids and the kappa cygnids. The former is elusive and runs from 22nd Sept to 10th Oct. The peak is between 4th and 10th Oct. The latter last from 3rd Aug to 25th Aug and peaks with a ZHR of 3 around 17th Aug. They are easily lost in the fireworks of the Perseid meteor shower on around the same time. There was once a listed alpha cygnids shower in July into August but this has disappeared from modern lists as it may never have existed!